Case consists of 10 boxes, 100 pages per box. 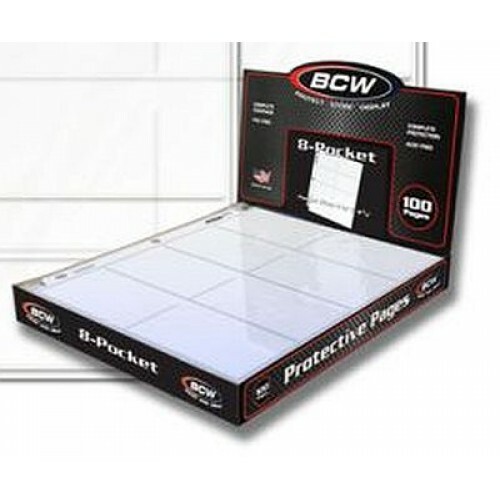 The BCW Pro 8-Pocket page is an acid free archival quality product that is perfect for storing tall or landscape trading cards. This product features high clarity polypropylene and toploading horizontal pockets with strong welds. BCW Pro 8-Pocket pages fit all standard 3-ring binders and albums. Use the 8 pocket page to protect store or display your tall collectible sports cards. These pages are also excellent for organizing grocery store coupons. Do you have any questions about Case of 1000 BCW Pro 8 Pocket Trading Card / Coupon Album Pages?